It started with a white coat ceremony in May and ended with a pinning ceremony in June. The six weeks in between offered life-altering experiences and unprecedented access to educational resources at the University of Florida for 80 college students from underrepresented and minority groups from all over the U.S., including California, Vermont, Minnesota, Texas, New York and Puerto Rico. A variety of factors can prevent equal access and exposure to academic resources for young adults from communities and families with social, economic and educational disadvantages — including those interested in health professions education. Enter the UF Summer Health Professions Education Program, or UF SHPEP, which made its debut on the UF Health Science Center campus this summer. Funded by a $415,000 grant from the Robert Wood Johnson Foundation, plus in-kind donations from the six health colleges, the free residential program focused on improving access to health professions information and resources for freshmen and sophomores from 54 colleges and universities across the country, including eight from UF. The unique opportunity was not lost on the students. Four main career pathways formed the interdisciplinary, interprofessional curriculum at UF’s SHPEP: dentistry, medicine, pharmacy, and public health and health professions. There also were closer-look segments in nursing, physician assistant studies and veterinary medicine. The big-picture emphasis was interprofessional education and an understanding of how each profession fits into the health care field globally, said Amy Blue, Ph.D., PHHP’s associate dean for educational affairs, and associate vice president for interprofessional education at UF Health. Patty Probert, Ph.D., assistant dean for the Office of Student Advocacy & Inclusion in the College of Dentistry, was the principal investigator on the RWJF grant. She led a group of around 20 faculty and staff members representing all six UF Health colleges that formed in October 2016 after UF received the RWJF grant. Like the SHPEP students, the team gelled throughout the program. The 80 students, known as scholars, got intense exposure to academic health, but SHPEP offered much more. They learned about health care opportunities in the Air Force, Army and Navy; they attended a college stress and coping workshop; and they learned about community outreach with UF HealthStreet, a community engagement program supported by PHHP, the College of Medicine and UF’s Clinical and Translational Science Institute. SHPEP even provided modules in career and study skill development, leadership and communication skills, health policy education, financial literacy, and civil rights. Mock admissions interviews and essays, hands-on clinical experiences, and didactic and clinical interaction with faculty from each of the health colleges empowered students to believe they can accomplish goals they didn’t know were possible. 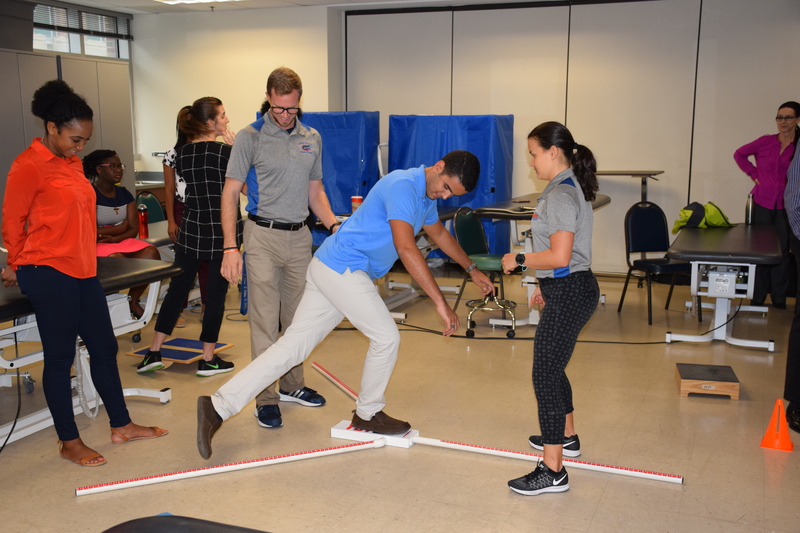 Doctor of Physical Therapy students led SHPEP scholars through activities designed to give them a closer look at the PT profession. PHHP faculty, current students and alumni presented to scholars on the health professions disciplines offered in the college, and the various career options in public health. SHPEP participants also engaged in a case discussion and debate about soda taxes facilitated by PHHP faculty members. 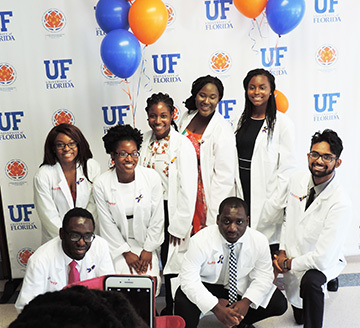 The program also­­­ gave scholars a chance to spend time with UF students with similar backgrounds, in a health profession they aspire to join. A smoking car, volunteers coated in fake blood and moaning from injuries, and Gainesville and Alachua County public health and emergency medical services crews all combined one muggy day in June for perhaps the most riveting training exercise for the SHPEP scholars, a mass casualty drill. SHPEP provided all of the students a voice for themselves and the confidence to advocate for their needs, as well as a multitude of tools and resources for successful application to and matriculation into health professions educational programs. 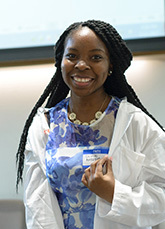 “This program literally changed my life,’’ said University of Texas student Grace Akinyemi. The SHPEP scholars were mature, well-prepared and driven, said Takeshia Pierre, M.P.H., UF SHPEP program coordinator. Professional, intrigued and engaged — all words used to describe UF’s first SHPEP cohort. Six weeks set up the potential for a lifetime of success. Thank you for joining us Sept. 30 for fun, food and football! 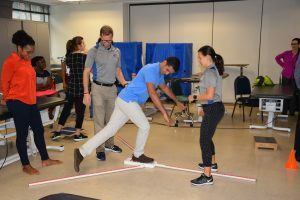 The college has received approval to offer the Doctor of Occupational Therapy, the first such degree program offered by a Florida public institution. A study of the brains of deceased NFL players raised concerns once again about concussions. Dr. Russell Bauer and Dr. Michael Jaffee argue there is still a lot we don’t know.